Preheat oven to 450F degrees / 250C. Place carrots and cauliflower on a rimmed baking sheet; toss with cumin and 2 tablespoons coconut oil. Season with salt and pepper. Spread half the vegetables on a second baking sheet. Roast until browned and tender, 20 to 25 minutes, rotating sheets and tossing halfway through. Cool to room temperature. Meanwhile, in a medium saucepan, bring 1 1/4 cups salted water to a boil. Stir in couscous; cover and remove from heat. Let stand until tender, 5 minutes. Fluff with a fork; set aside to cool, uncovered. Make dressing: In a small bowl, whisk together lemon zest and juice and olive oil; season with salt and pepper. 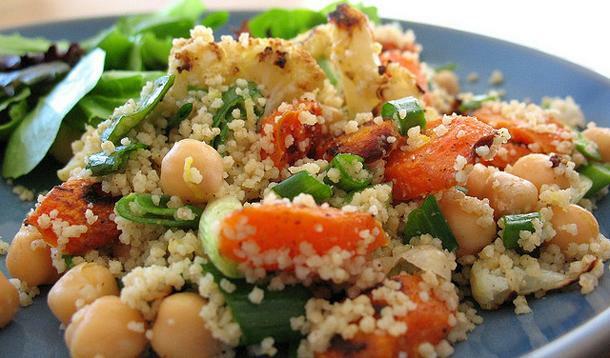 In a large bowl, combine roasted vegetables with couscous, chickpeas, and scallions. Place rocket on a serving platter, and drizzle with 1 tablespoon of the dressing. Add remaining dressing to couscous mixture, and toss; serve over rocket. Tip: If you have a little extra time, gentle fry the rinsed chickpeas in some coconut oil with a squeeze of lemon and seasoning until golden brown, just adds to the yumminess. One doesn’t actually see cows with horns all that often anymore. In fact, it seems almost normal that cows don’t have them. Even as a child I was under the impression that only bulls had horns. Horns are not merely for ornamentation, they play significant roles in the animals’ wellbeing. Independent research shows the importance played by cows horns in aiding digesting and regulating temperature. Dehorning is the removal of the horns from cattle. It is a labour-intensive, skilled operation and incredibly painful for the animal. Local anaesthesia, combined with a sedative and an analgesic (pain reliever), may provide the best pain relief but is often not administered due to cost implications or may be limited by the availability of drugs for farmers to use and the scarcity of veterinarians in the area of the farm. The 20th Century practice of dehorning animals is more economical than ethical or natural. To ensure no horn regrowth, it is essential to cut away 1 cm of skin around the base of the horn. 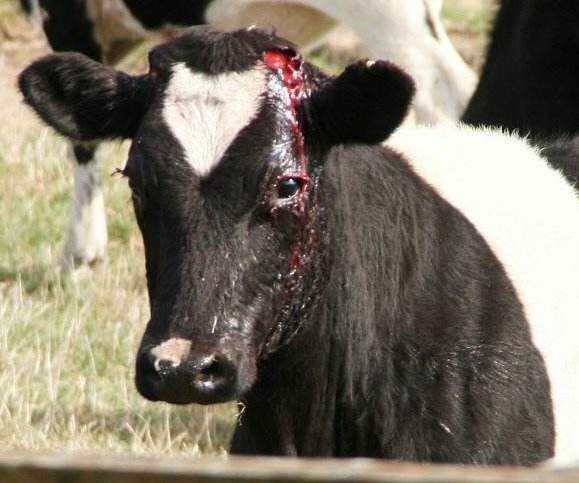 The occurrence of severe bruising is much lower in dehorned than in horned cattle. Bruised meat on carcases, usually the result of horn blows during transport, is condemned for human consumption at abattoirs and causes great financial losses. Cattle can be fed more conveniently and easily with less interference from dominant animals. Less trough space is required for dehorned than for horned animals. There is less danger of injury to udders, flanks and eyes, as well as to attendants. A larger number of dehorned animals can be trucked, housed and fed together. Cows on biodynamic or Demeter farms, however, are whole cows. They are allowed to keep their horns. The horns grow gradually. They start out delicately when the calf is three months old and already eating grass and hay. The horns are often beautifully formed, curved more strongly as the cow grows older, and eventually turning into a majestic headdress. During the cow’s whole life this extremely hard organ keeps growing in size and perfection. 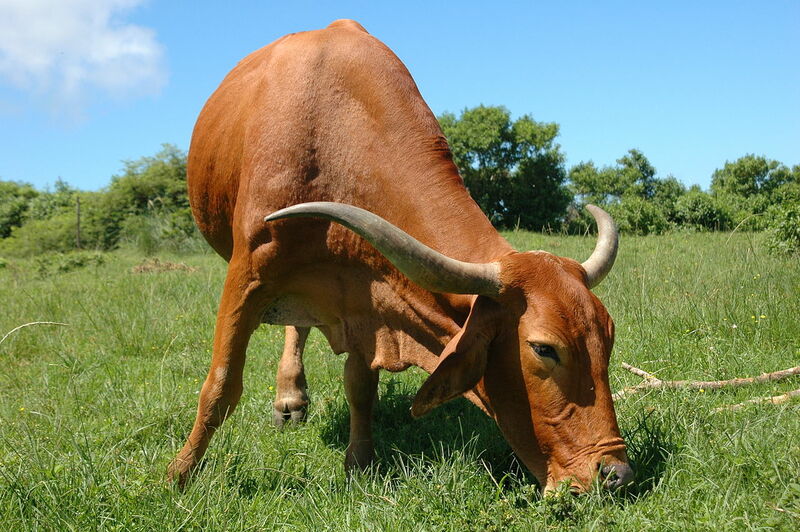 As social organs, the horns allow cows to find, and keep, a tentative balance between being an individual animal, and being a part of the herd. Cows without horns become nervous and even aggressive. ← Mindful Monday – What Makes a Healthy Community?